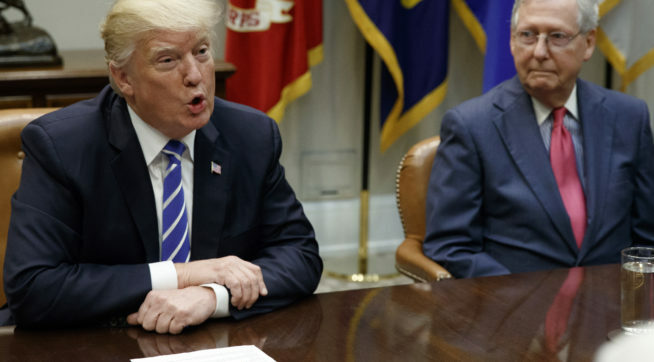 President Trump and Majority Leader McConnell. (Evan Vucci/AP). As part of his campaign platform, then-candidate Trump called for a litany of immigration reforms, including his trademark cry for a “beautiful” wall along the US-Mexico border. Trump’s campaign, however, offered little detail on design, or how the wall would function in the rough border terrain. The administration has since revealed several prototypes, but the final plans remain ambiguous and unfunded by lawmakers. Despite Trump’s vague proposal, he will soon use the enigmatic wall as a bottom-line for negotiations on DACA (Deferred Action for Childhood Arrivals) legislation, requiring funding for construction in exchange for his signature on the bill. But Trump can score a major legislative victory- one that protects undocumented children and implements tough border security measures- by bargaining for a different version of the wall. Specifically, one without traditional brick and mortar components. Trump’s action on DACA began last September when he revoked the Obama-era program- one that protects some 800,000 undocumented children (Dreamers) from deportation- arguing that it was an unconstitutional use of presidential authority. In effort to find a permanent solution for Dreamers, Trump gave Congress six months to codify the program before it was terminated. Met with outrage from DACA supporters, Trump nonetheless insisted that legislation was the best way to shield undocumented children from removal. 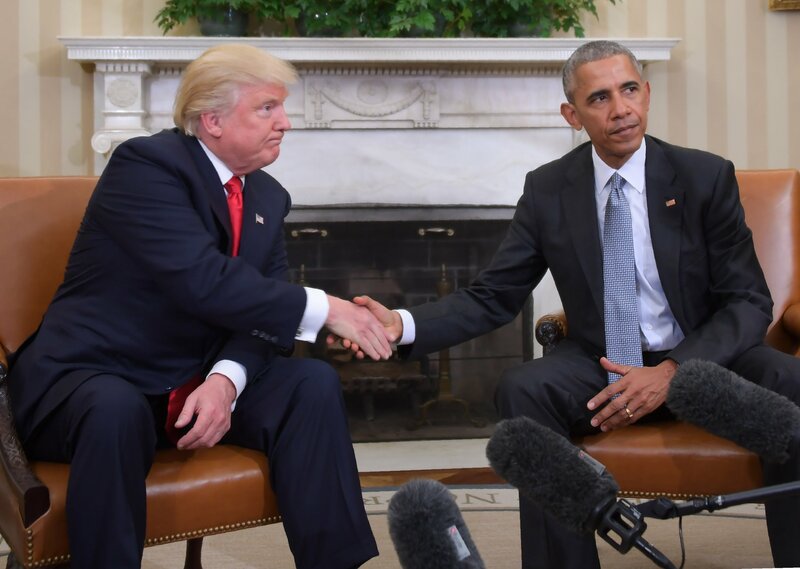 Then President-Elect Trump meeting with President Obama. (Jim Watson/AFP/Getty). In addition to being constitutionally sound, it was also a politically savvy decision. By terminating DACA, Trump satisfied his supporters who expect a rollback of progressive Obama-era immigration policies. Trump has also forced Democrats to bargain on legislation that protects Dreamers, but may also codify the same anti-immigration measures he campaigned on in 2016. So, as Congress reconvenes after the holiday recess, DACA negotiations will turn on several ideological and policy-based goals of the administration and congressional leaders. For Democrats, their primary goal is to install permanent protections for Dreamers. By granting 800,000 undocumented people temporary residency, DACA would shift US policy toward a more pro-immigration approach favored by liberals. Not only would this pay political dividends now, but Democrats could use DACA as a basis to bargain for additional liberal reforms in the future. In addition to fulfilling their immigration platform, Democrats also value future electoral support from Dreamers. A majority of Dreamers are Hispanic, a demographic that largely supports liberal policies and the Democratic Party. With the support of Dreamers in future elections, Democrats can confidently pursue social policies that complement their legislative goals. Lastly, though just as important, Democrats want to stop construction of the border wall. Seen by liberals as a costly exposition of xenophobia, congressional funding for the wall would be a huge victory for Trump, and a devastating loss for Democrats. Indeed, the wall is such anathema to congressional Democrats that their leadership refuses to broker any deal that funds construction. On the other side of the aisle, Congressional Republicans are demanding that a variety security measures be included with the DACA bill. To please conservative voters and reduce illegal immigration, these provisions include additional fencing, technology that detects illegal crossings and funding for more Border Patrol agents. In addition, Trump has called for the end of chain and lottery immigration systems. These policies, respectively, allow family members of US citizens and people from underrepresented countries to receive permanent residency. Citing the New York City subway bombing last December, Trump has argued that these programs allow foreign terrorists to enter the country. DACA has broad support from Americans and congressional leaders. (Ethan Miller/Getty). Of course, Trump’s most emphatic demand is for a border wall. Though it served as a free rhetorical tool during his campaign rallies, a permanent barrier covering the roughly 1900 mile border would be expensive. Despite the cost and congressional opposition, Trump holds funding for the wall as an essential component to any DACA deal. And so, the border wall constitutes the edge of both parties’ bargaining zones in the upcoming DACA negotiation. Because Democrats are unlikely to agree to a bill that funds a new barrier, Trump will need to find a way pass a bill that still includes the wall he promised his supporters. For Trump, this means negotiating for a wall in a metaphorical sense, rather than literal. After more than a year of promoting a physical wall without any tangible results, Trump must pivot to policies that build a symbolic barrier that continues to galvanize his base. More than likely, Trump supporters have wised to the notion that Mexico will not pay for a wall, nor is construction possible across the entire border. Instead, alternative security measures- ones that prevent illegal immigration without a physical barrier- would still deter illegal border crossings and assuage the concerns of Trump voters. These provisions include existing Republican demands of electronic detection systems, strategically placed fencing, more federal agents on patrol and limitations on chain and lottery immigration. Additionally, a DACA bill without a physical wall pressures Democrats into backing a program they must deliver to their base. Refusal to support DACA because of wall funding would be tolerated by liberals, but failure to protect Dreamers because of banal provisions like electronic surveillance would be politically unacceptable for Democrats. So, Trump can score a major legislative victory if he pivots away from the worn concept of a physical wall along the border. Not only can he secure funding for immigration deterrents that would satisfy his campaign promises, he can claim responsibility for passing liberal immigration policy that the protects the very Hispanic voters Democrats are counting on in future elections.